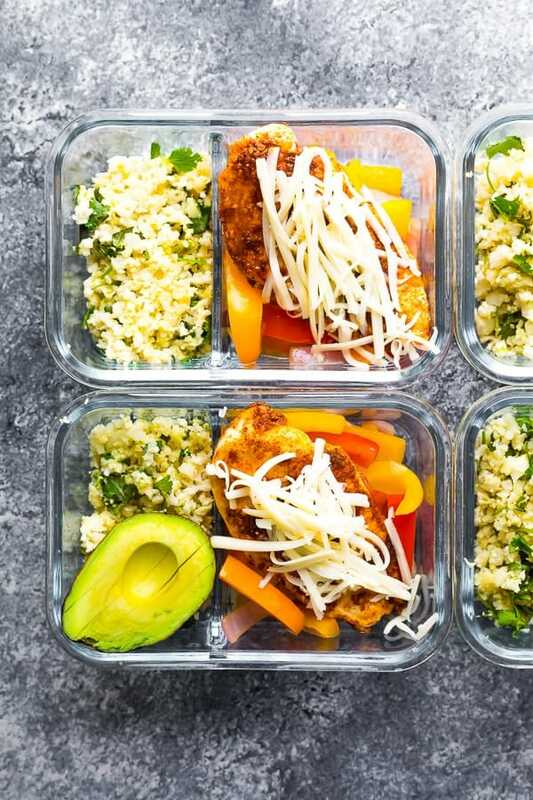 Santa Fe chicken low carb meal prep has cilantro lime cauliflower rice and bell peppers topped with taco-seasoned chicken breast and cheese! 8 g net carbs but still fills you up. I’ve always been of the impression that low carb can’t be filling, but after playing around with some low carb meal prep recipes lately, I’ve found that is oh-so-wrong! I’m not on a low carb diet, but I know a lot of you are and that it can be challenging to find low carb meal prep recipes that a) aren’t full of artificial sweeteners or weird alternative flours b) actually fill you up and c) taste really yummy! There are a few components to this recipe but you should be able to prep and cook everything in under 30 minutes. Can I swap out the chicken for another protein? Absolutely! I’d swap for 3/4 lb of ground turkey or ground beef, or even some black beans (though that will no longer be low carb). 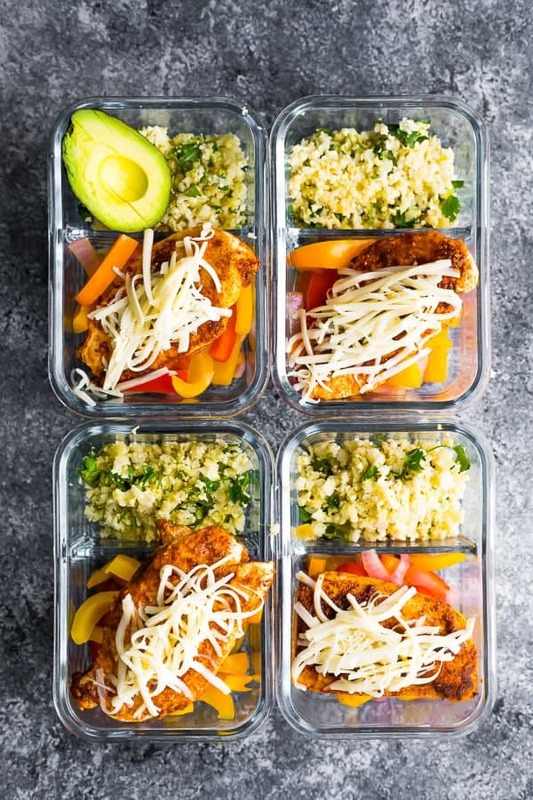 How can I lower the carb count in this low carb chicken meal prep? Try replacing a portion of the onions and bell peppers with some mushrooms and zucchini, which have overall less net carbs. Santa Fe chicken low carb meal prep has cilantro lime cauliflower rice and bell peppers topped with seasoned chicken breast and cheese! 8 g net carbs. Add the riced cauliflower, salt, garlic powder and lime zest. Cook 5 or so minutes, until cauliflower rice is slightly softened (you want it to maintain some crunch). 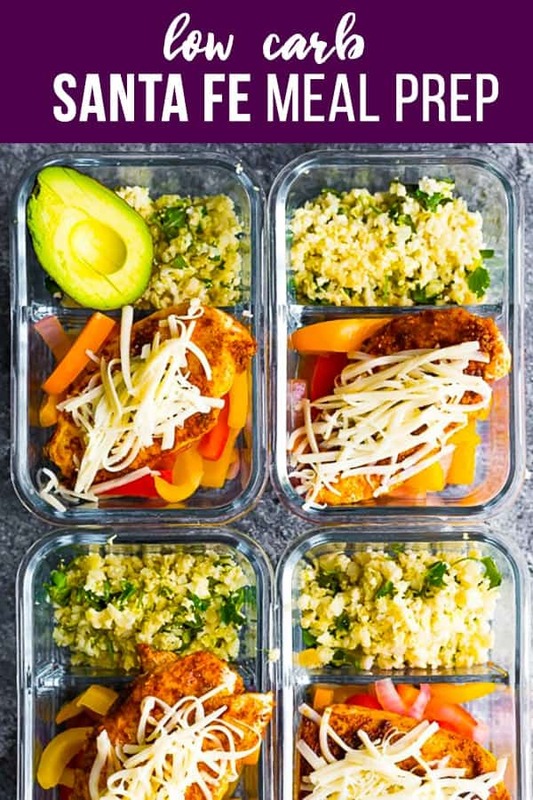 Remove from heat and divide between four meal prep containers. Add another 1 tablespoon of olive oil to the pan. Add bell peppers and onion, and cook for 5 or so minutes, until slightly softened. 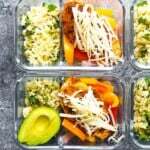 Remove from heat and divide between meal prep containers. 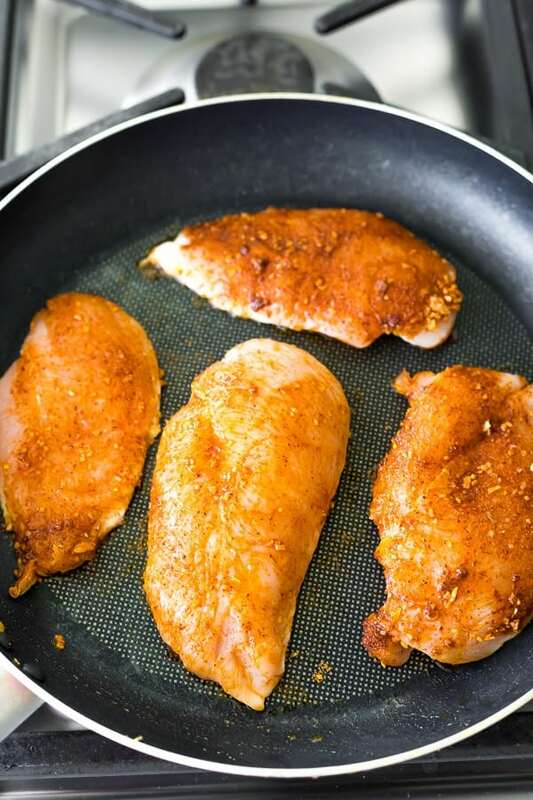 Prepare the chicken: slice horizontally to make 2 thin pieces from each chicken breast. Brush with olive oil and sprinkle with taco seasoning. Add chicken to the pan and cook 4-5 minutes per side. Remove from heat, cover and allow to rest in the pan for 5 minutes. 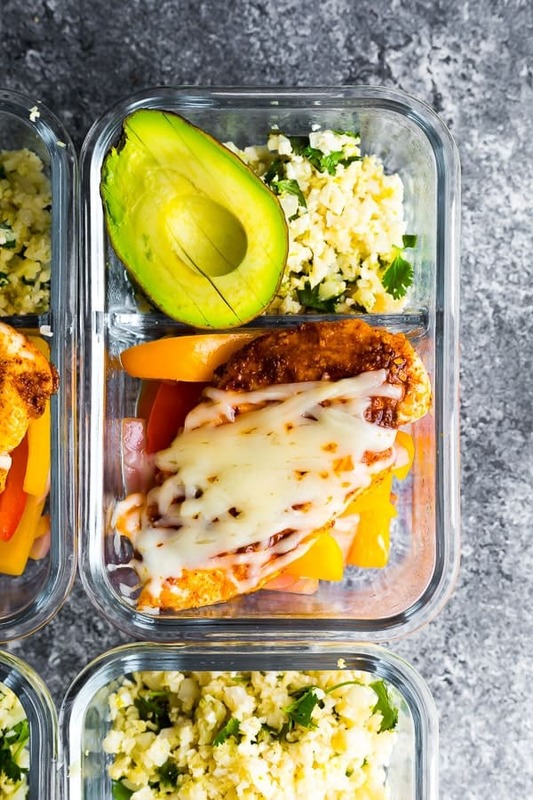 Divide chicken between meal prep containers, along with cheese (1 tablespoons per bowl). Store in sealed container in the fridge for up to 4 days. Heat in the microwave until steaming hot, and cheese is melted over the chicken. Add sliced avocado fresh, if desired. How much mushrooms and zucchini would you use? I would aim for 1 cup veggies per bowl, but I don’t know how that will work out for nutritional info…you can play around with the quantities in a nutritional calculator like on My Fitness Pal! Really great recipe – the rice came out fantastic. I added some garlic & chili infused olive oil and lime juice and it paired perfectly with the chicken. My kids gobbled it up! I’m so happy to hear this! Thanks so much for your review, Jenn! Really the Nutritional info helps alot! 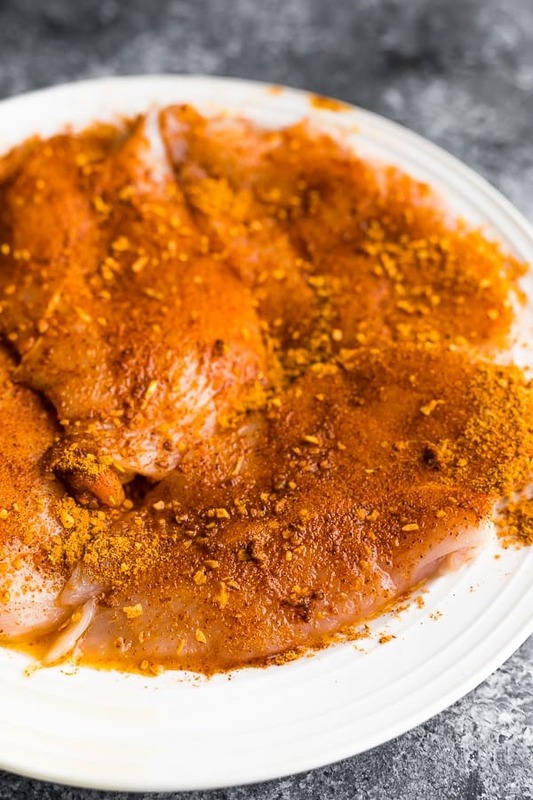 Chicken combined with any low carb recipe is the perfect food for weight loss!